Here you can upload artwork files to us, for production of banners and Lumaline products. If you do not already have log-in information, please contact us and ask for it. The log-in information is the same as we have used earlier for our previous ftp-server. Of course you can still use your own favorite ftp-client, and upload the way you are used to. 3. 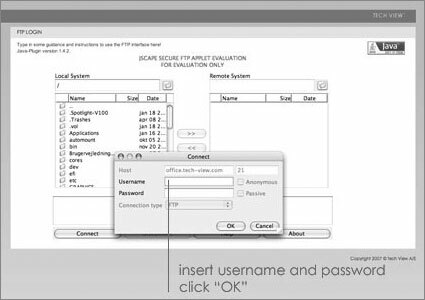 Type username and password - click "ok"
Secure FTP Applet is a secure FTP client component that runs within your web browser. 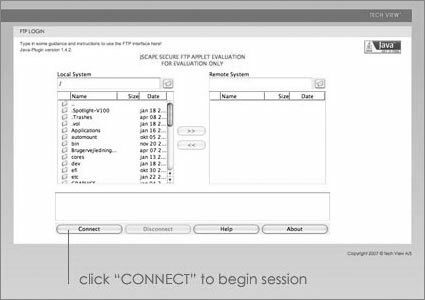 Secure FTP Applet removes the need to install and support FTP client software while encrypting all data exchanged between the client and server using either the SFTP (FTP over SSH) or FTPS (FTP over SSL) protocols. Using Secure FTP Applet you can securely transfer multiple files and directories, delete files, rename files, create directories and so on all within your browser and without installing any software. Please give us a call or an send us an e-mail when your upload is done.